1. Mhashal, A. R.; Pshetitsky, Y.; Cheatum, C. M.; Kohen, A.; Major, D. T. Evolutionary Effects on Bound Substrate pKa in Dihydrofolate Reductase. J. Am. Chem. Soc. Accepted. 2018. 2. Chakraborty, A.; Dixit, M.; Major, D. T. Predicting Accurate Cathode Properties of Layered Oxide Materials Using the SCAN Meta-GGA Density Functional. npj Computational Materials. Accepted 2018. 3. Driller, R.; Janke, S.; Fuchs, M.; Warner, E.; Mhashal, A. R.; Major, D. T.; Christmann, M.; Brück, T.; Loll, B. Towards a comprehensive understanding of the structural dynamics of a bacterial diterpene synthase during catalysis. Nat. Commun. Accepted. 2018. 4. Major, D. T. Complex Terpenes in One Pot. Nat. Catal. 2018, 1, 567-568. 5. Das, S.; Nam, K.; Major, D. T. Rapid Convergence of Energy and Free Energy Profiles with QM Size in QM/MM Simulations of Proton Transfer in DNA. J. Chem. Theory Comp. 2018, 14, 1695-1705. 1. Development of quantum simulation tools for nuclear quantum effects in enzyme catalysis. This entails development of new path-integral methods for the simulations of zero-point energy and tunneling effects in condensed phase environments. 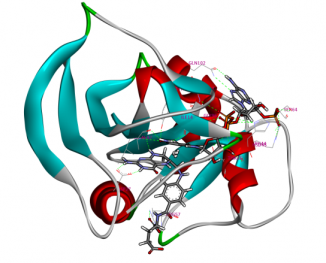 Several new methods are being developed and are incorporated into simulation platforms for enzymatic reactions. 2. Development of hybrid quantum mechanics/molecular mechanics methods. This includes the development of specific reaction parameter semi-empirical Hamiltonians for use in enzyme simulations. Additionally, we also develop novel perturbation approaches wherein a low-level Hamiltonian is perturbed into a higher level one with a view to enhance accuracy at a reduced computational cost. 3. Study dynamical effects and tunnelling in enzyme catalysis through hydrogen transfer reactions. This involves studying several important enzyme systems such as the hydride transfer in dihydrofolate reductase and formate dehydrogenase. 4. Enzyme mechanisms through heavy atom kinetic isotope effects. This approach entails the study of the reaction mechanism in deaminase and decarboxylase enzymes via heavy atom kinetic isotope effects. 6. Properties of functional surface groups in self-assembled monolayers. This project includes the computation of the pH-dependent vibrational spectrum of carboxylate terminated monolayers via novel QM/MM applications in combination with molecular dynamics simulations.